Noliac's line of Ceramic Multilayer Actuators (CMA and SCMA) products is based on the company's advanced multilayer technology, harnessing the full potential of the piezoelectric effect at very low operating voltages. Multilayer piezoelectric actuators (CMA) are ­co-fired multilayer ceramics typically with a height up to 2-3mm and with up to 100 ceramic layers. Multilayer piezoelectric stack actuators (SCMA) are made of two or several single actuators (CMA) glued together. The purpose of the stacking is to obtain more displacement than can be achieved by a single actuator. 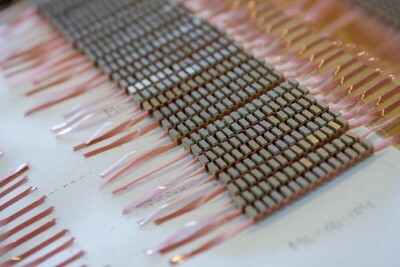 Multilayer piezoelectric actuators can be made very small, e.g. 1mm x 1mm x 0.2mm, and can be designed in a variety of geometries, such as squares, rings and discs. The most common actuator geometry is a square with typical performance ranges up to 5µm stroke and up to 4000N blocking force. Noliac has also developed ring or disc shape actuators with typical performance ranges up to 5µm stroke and up to more than 30000N blocking force. Multilayer actuators are used in numerous applications within e.g. IT (hard disc drives), optics, telecommunications, instrumentation, automotive, nano-positioning, etc. Noliac's single actuators, plates (CMAP) and rings (CMAR), can be stacked. Thereby, the height can be made according to your needs. Stacked plates are called SCMAP and stacked rings are called SCMAR. Noliac's stacking technology also offers a unique manufacturing flexibility as any actuator height can be made from a defined number of CMA's. The most common actuator geometry is a square (SCMAP) with typical performance ranges up to 200µm stroke and up to 4000N blocking force. Noliac has also developed ring shape actuators (SCMAR) with typical performance ranges up to 200µm stroke and up to more than 8000N blocking force.